← New Community Center? No Increases! History can sit silent for decades. Then, without warning, it reveals itself in a way that moves your soul and reminds you of what’s important. This is exactly what just happened to me. For years now, I have worked behind a hand-me-down desk. Made of solid oak in the most traditional style, I inherited this massive, custom-built citadel from our company’s founder, Ed Boudreau. Now, the style in our new corporate office is anything but traditional. It’s filled with bright colors and shaped by clean, geometric lines. It made me think it was time for a new – more contemporary – desk. I mentioned it to Ed, and that’s when I learned this story. Like our firm, the desk was over 36 years old. Purchased in 1974 (for the then-unthinkable price of $3,000), the desk had always been part of our company history. In fact, the desk had spent several decades “on the move” from one CCMC corporate office building to the next. Over the years, the desk was moved no less than seven times, across two different states. It had always been the president’s desk. After learning this, I knew this desk was part of a tradition I could not exterminate. I decided to keep the desk and made arrangements to have it refinished. In preparation for this, the desk was dismantled. 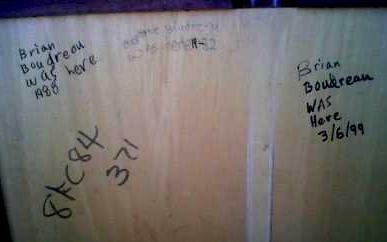 During this process we discovered the inscribed names of two of Ed’s children underneath the desk. You see, back in the early days of our company everyone was expected to work Saturdays. On these days, it was typical for some of Ed’s six children to accompany him to the office. They spent many hours watching cartoons and playing underneath this desk. Two of them, Stephanie (now 39 living in Switzerland) and Brian (now 32, in Iraq), had left their signatures for me to find all these years later. This year will be my 23rd with CCMC. The memories of all those Saturdays, all the hard work, all the lessons learned, all the history made; have made us the thriving company we are today. Like Ed’s children, each of our employees will put his personal touch or her own mark on CCMC. Each person will become a lasting part of our company’s family history. This history will continue to tell the story of our people and how they are passionate about improving the quality of life for those we serve.